Why choose Certified Hereford Beef? Certified Hereford Beef uses only Hereford and Hereford-crossbred cattle, which are genetically proven to produce better beef. These are cattle that have been bred for taste since the 1700s and were virtually all you'd have found in the beef supply of the 1940s, '50s, and '60s, the golden era of great tasting beef. Cattle ranchers around the world have long known that great tasting beef doesn't just come from great cooks; it comes from great cattle. They reckoned you had to start out with good stock to get a good, gourmet steak. It turns out they were right! In 1991, the American Hereford Association, the nation's oldest pedigree livestock organization, undertook history's most ambitious and comprehensive cattle breed study to measure the quality advantage of Hereford cattle for producing premium steaks. Colorado State University researchers wanted to learn firsthand how Hereford beef rates in the minds and mouths of trained taste-testers. 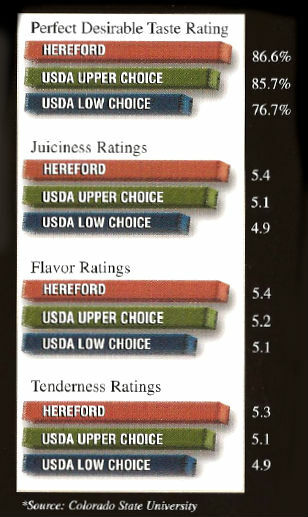 The results showed that Hereford beef was superior in every category. When it comes to taste, tenderness, and juiciness, Certified Hereford is naturally better beef, and therefore makes the best online steaks. Quality is a delivered promise with Certified Hereford Beef, a type of beef that provides a satisfying eating experience every time. All Certified Hereford Beef is individually evaluated and certified by USDA meat graders for marbling, maturity, leanness, and color. Certified Hereford Beef is proven to be tender, juicy, and flavorful, time-after-time. When you order steaks online, you know exactly what to expect when you choose Certified Hereford Beef. Certified Hereford Beef is all-natural. These Hereford cattle spend the majority of their lives on grass and are grain-finished. All Certified Hereford Beef comes from cattle that graze on grass, and to finish, are fed a vegetarian, grain diet. If you are looking for grass-fed beef online, Certified Hereford Beef is a great choice for your premium steak order. Today, Certified Hereford Beef comes from the same Hereford and Hereford-crossbred cattle the 1950s brought forth during the golden age of great tasting beef. In developing aging beef guidelines, the primary factors to consider are: (1) days of aging, (2) storage temperature, (3) relative humidity, and (4) air flow. The greatest reason for aging beef is to further enhance its flavor and to impart the flavor notes that are generally associated with this product.